The TS80 runs very similar hardware to the TS100 iron. The firmware does not need many changes to support this. Hi, I'm thinking about porting the STM32 USB-PD (Power Delivery) to ts80, but I'm not quite sure about the hardware of TS80. I mean, will the hardware of TS80 support 20V 2A? Sadly the TS80 does not support 20V (will die around 16V). The connections are not made for the USB-PD pins (No CC Pins). There is only wiring to the D+ and D- pins. That's a pity. Thought this may work. Yeah :( I can dream of everything being neat like this. I'll keep on the manufacturers case to try and push for a USB-PD model, but I feel that it might be a ways off. Though, a really nice product if your up for it, that is on my to-build list but buried too far deep would be to make a small USB-c inline adapater that converts between USB-PD and Quick Charge 3.0. If you have interest in making that ^ hit me up via email and i'm happy to have a yarn about it. But think about it, maybe building a TS12 tips compatible, 3d-printable, USB-PD/QC3.0 compatible iron will get much more attention and be more attractive for the most hobbyists. Progress is happening on this FYI to anyone reading, I just edit the top comment to track progress. Getting towards a releasable build soon. Would it be possible to use this with a regular 12V/9V supply instead of QC, e.g. by detecting a higher voltage on the input? Note that going much above 9v will pull more than 18W and I haven't tested how the tip and tip connector will last. The Weller WRMP pushes 40W through a similar 3.5mm connector, so the ~30% overclock from running the TS80 at 24W from a 12V supply shouldn't be a problem, though I do understand it's what's inside the plug that actually matters. If it is though, implementing a power limit by calculating the maximum PWM duty cycle to keep it under 20W shouldn't be that complicated I'd reckon? The changes over at #275 will come into play here nicely. My biggest concern is just peak current rating and if the connector starts to heat, since if it heats it becomes a more significant drift in the temperature measurement. I'm going to keep the QC code negotiating for 18W as thats the max for most adapaters (all?). However I wont stop you feeding in more. Note that some of the circuitry is only rated to ~16V though. 12V should be a nice point though. Also interested to look into the options for taking the voltage up higher anyway and just having a more stable PID. I thought I remembered it right, the stock firmware has the power setting from 16W to 24W, even though QC3 only supports up to 18W. But it would indicate the iron can handle 12V no problem. Nice catch, I never had the original firmware work well on my unit so I haven't been through it thoroughly yet. I have also had confirmation that 12V 2A is supported by the unit which is really good. Though negotiating for 12V may come later on in my firmware since I want to do the tip calibration and then push out a beta version. Will it accept firmware update from TS100? Will it turn into a brick afterwards? Are there any TS80 bootloader-compatible firmware updates in the wild? @joric if you flash the ts100 firmware it will not die, but the pinouts are only similar on the OLED. Nothing else will work. If you want I can upload a build of my TS80 fork here for you, its only really waiting on time to tune in the tip temperature calibration. Yeah, I guess, not only for me though. Could be useful for all ts80 owners if something goes wrong. Yeah, its currently just an issue where the temp cal is fairly far whacked out atm (like 30 C). Cant do much else atm though, no time for development. It is a QC3 device, it won't work with PD! QC is a proprietary protocol that is not compatible with the USB-PD standard. The 3.5mm Jack shouldn't take the strain at all and the mental housing takes the force. The only TS80's I have seen have all been fairly snug with justa little bit of wiggle which is normal. In my firmware I'm allowing 5V operation as a fallback which works with some PD chargers that don't follow the spec completely. Also their charger does the higher 24W support which is good. EDIT: that charger looks to be PD only from what I can see. Funny that Xiaomi 65W PD Laptop charger (CDQ07ZM) charges this powerbank but doesn't power up the iron directly. May be used as intermediary device. It's rated 12V*1.5A (18W) Max. Supports "double way Quick Charge" whatever this is, but charges just fine from my PD charger (TS80 doesn't work with the PD charger but works with the power bank). Doesn't look like the $16 power bank (PLM01ZM) is much different from that $25 one (PLM03ZM). I guess the difference is Type-C that AFAIK is input only (at least it doesn't charge my phone from Type-C). The PLM01ZM and PLM03ZM are the same for the most part. However, the newer PLM03ZM’s fast charge controller also supports Qualcomm’s Quick Charge 3.0 (PLM01ZM only Quick Charge 2.0). So there will be some gains if you pair it with a QC3.0 charger (to charge the power bank) or use it to charge a QC3.0 device. I really don't know if QC2.0 is compatible with this iron, maybe someone here can tell. The Omni has QC 3.0 too, and has more than double the capacity. @Ralim would you have a test version of the firmware available? Oh boy! Has the same features and double the capacity of the $16 power bank! So, quick math, 16*2 = 32, how much is the Omni again? Oh. So you can buy 20 Xiaomi power banks right now, or donate money through kickstarter for one Omni you might get somewhere in the next two years, if you are lucky. There's absolutely no reason to buy the Omni unless you have a real need for the AC inverter output, and even then I'd buy something that actually exists, and not donate through kickstarter. @Ralim looks like we got stock 1.06 firmware hex from minidso (no sources yet but it could be helpful to restore TS80 to factory state). Direct link to file: TS80.V1.06.hex (from this forum post). I just've flashed using stock DFU bootloader it and I confirm it works and temperatures seem to be accurate. @joric QC2 should work on their firmware from my reading. Here is a rough build, will feel very similar. Would love feedback on if QC works for you. 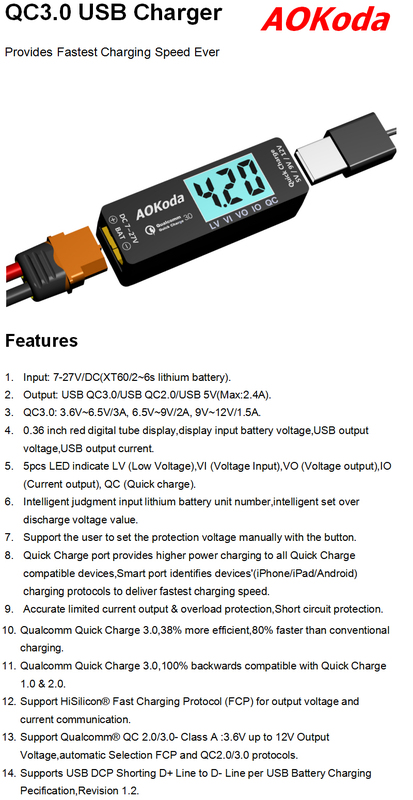 but as i see in details this Aokoda has low voltage protection, am i right? @jvdmeulen ? jvdmeulen - thanks for that confirmation. Well I've ordered one on the strength of the over discharge protection alone. Protection is an odd beast. LiPo tends NOT to be protected in most cases because for some reason the manufacturers just don't do it and you'd have to dismantle the battery to add cell level protection. if you look round the forums - people seem happy to accept that their drone may explode at any time... (and I suppose that dropping one from 10000 feet is an everyday risk. Dunno if its a weight issue or what but the construction of a LiPo accommodates balance charging and explosions but not protection! (you can get blast bags for storage and carbon fibre bullet proof vests to minimise damage caused. What I think of as Li-ion (18650 and phone batteries) still don't have compulsory protection. I don't know this as fact - but my impression is that where single cells are to be used, protection is usual. Where batteries will be made up - they come without protection and it's added later (I have a box of single, double etc, etc cell protection/charge boards for constructing batteries of various capacities/sizes. Guys I don't think this is a good place to continue thr discussion about alternative power sources for TS80. This is an issue opened for TS80 firmware support and right now there's probably more about the power sources than the firmware itself. Just think about someone new coming here, trying to find the latest build for TS80 only to get lost in the bunch of off topic messages. Maybe a discord channel would be better for generic TS80 discussions. @Ralim add ts80 binary to the latest release please so the guy above could be happy. Upd oh there were TS80_EN.hex (and other languages) in the release section already, my bad. It might however point this new visitor towards the answer to why their brand new QC3 powerbank isn't powering their TS80 (or indeed why their old USB2 powerbank isn't either). Its not just about firmware per se. The thread is after all TS80 support. and QC3 compatibility (or incompatibility) is an intrinsic part of the TS80 spec. Perhaps at 444 comments that fight is already lost and a new thread is a little overdue for opening, I doubt the situation its recoverable either way. If you are lost and require redirection. I had a bit of mishap with TS80 two days ago, I managed to reverse polarity on that one (first time in 10 years). Magic smoke escaped and the iron was not turning on. Having no schematic I resorted to guessing, STM32 looked intact and even the dc-dc converter was showing signs of life. As it turns out, only the resettable fuse was blown. For the time being I bridged it, but would welcome confirmation if it's the right part - digging through Aliexpress I think I found it - 32V 3A SMD1206 CC12H3A-TR. Can anyone with schematic confirm? Schematic doesnt show anything overly useful for the fuse, but that one looks good! Have you received the USB/QC3 modules I mentioned sometime back in this thread? Have you tried them? I have received them, they work well for my use cases (using my ts100 batteries). Handle 24W mode fine so far. Just haven't found a good case for them yet. I'm not involved with Aokoda in any way. I've been using one with a 4s LiPo for a couple of weeks now, I've had a reasonable chance to use it and abuse it enough to be willing to give it my pretty confident seal of approval. It has a settable over-discharge warning as well as built in short circuit overload etc etc protection .... it also has a very dinky power mode which allows you to connect not just LiPo batteries - but just about any input source (from 7v-27v) through it's XT60 connector to power the QC3 output for an iron (and every other QC3 thingy I own). Effectively making it a neat, cheap and effective general power source conditioning / protection option. I wish I'd found it earlier I got 2 units from a UK e-bay seller for £6.99 ea. Made up a couple of XT60 to various plug adapters - and ready to roll wherever I need. Can get a buck boost converter and a buck QC3 controller to cover a slightly more convenient 3.3v - 32v range for just £5.55 on eBay but still needs a case the Aokoda is much more compact and neater if you can manage without the lower voltage USB powerbank option. I'll probably settle for the Aokoda and also carry the buck boost to allow me to use anything from a couple of AAs or an 18650 to an 6s LiPo. For anyone who moves around or is trying out new (or dodgy) kit, at only £7 it's maybe worth using the Aokoda routinely as a sacrificial defensive precaution. Boiling water is the safest method for people who do not have the means to measure the tip temperature. If you know of another method to get the tip at least 50+ deg C above ambient in a repeatable way, im all ears. Here's an idea. Eutectic solder melts and freezes at one temperature point, 183°C for Sn63Pb37 and 179°C for Sn62Pb36Ag2. Set an advanced calibration to one of those temperatures and once the solder start to melt, you're spot on. I've used a ring of solder round the tip as long as I've been using solder, its a useful landmark. Like most components, solder from reputable sources comes with a datasheet. Although in the UK as of 1 March 2018, Leaded solder is for "professional" use only, Rapid have recently altered their website so now only "professional" account holders can buy lead based solder ... Chinesium solder is more like a lottery, there is more lead in the atmosphere than in many of their solders. 200c - as soon as iron passed 190c - the tip "broke" and the solder went plastic. I don't hang too much on the display ... but I'd say that was pretty text book. room temp is 21.8c, humidity 48% - voltage 9.18v (missed the current - looking at temp) and I'm using v2.06-RC4. Reset the iron but not calibrated, detail mode ticked. The display is a bit flicky but consistent - temp rapidly hunts +/- 1deg round target when "at rest" but all lettering is solid and in line. I'm pleased as punch - think I'll go put the kettle on. Yes, the tip "breaks" the solder at much higher temperature than melting point, I know about this. But still, if the tip was wetted before the temp calibration, and a new solder added to it at melting point, that would show the correct temperature with about 1-3°C accuracy with eutectic, not 60/40, solder. Water isn't as consistent as some might think - minerals in it combined with atm pressure can easily move the boiling point downwards. Gotta agree on the leaded solder, and it's both enraging and disappointing move. However, quality leaded solder can still be purchased in the EU without turning to shoddy chinese products, only requires more digging. Last week I got myself Sn62/Pb36/Ag2, 500g spool for about $35. I'll be likely getting more, as it'll be valued in gold in future times. BTW, Kester 235 is still available through Farnell, if you don't mind paying shipping from Newark. No need to pay newark - I live 15 miles from the main Leeds depot I collect most of my kit over the counter. UK isn't quite as third world as some think - you can even drink the water thanks to them thar Victorians. I've had accounts with most of the suppliers for 30 years or so even though I don't think of myself as "pro", they do - thus I don't have supply problems myself, it's just the poor guys trying to stick wires together of a weekend. Long story, but 25 years ago I was working in an electronics plant in my home town when the bailiffs shut down the place. Turned out I knew one of them and was able to make offers on some of the items in the supply room I got a ton (almost literally!) of good 1mm 60/40 solder and enough wire/cable to reach the moon. All for a pittance. It set me up so my overheads were negligible when it mattered most. I still have more than I'll ever use in the loft. But I do still buy thin solder and paste for some smd work. I still like to know where the bargains are ... or at least which supppliers can be trusted ... and solder is about as basic (and essential) as water. Fuses arrived! Now I need a soldering iron to fix this soldering iron. I read the TS800 has a max temperature of 400°C. While the TS100 has 450°C. Is this a physical limitation or does the custom firmware allow for a higher temperature on the TS80? The tip isn't really rated for over 400 but will do it. The ts80 tip has a different thermocouple gain, so we cannot read over a certain point. This often falls between 420-440 depending on the tip and the tolerance of the gain resistors in your particular unit. Ts80 can go over 400C but how far varies, firmware will cap you at 450 but hardware may limit earlier. Loving this firmware, you guys have done a great job, its running really well on my TS80 - not sure how close the temp readouts are, I don’t have an accurate thermocouple here. I ran into some problems using the boot up image tool, uploading the DFU package seems to work, but the image doesn’t display on boot and it seems to mess up the scrolling text in menus (certain characters not displaying) - reflashing the latest RC4 fixed the text but still no logo. I assume the logo tool .exe just hasn’t been updated for the TS80 yet, I got excited when I saw a sample image file in the repo. Tried again this time with the Python tool and compared checksums - it produced a different file, tried that one and it worked flawlessly. Thanks to all the contributors making this happen! It may not be relevant but my TS80 failed this am when I powered it on today after only 20 or less hours of use. I am powering it through my bench DC supply that I had set to 5v and then increased the voltage to 12v. Normally I would set it to 12v and then connect my iron but meh. I have run this from 5v with no issues though it wont get very hot so I am not sure if the voltage change is what caused the issue or if it just failed randomly. I am not sure if the increase in voltage is the cause just noting what I did that may be of importance. If anyone has any input I would love to hear it. Not sure if I can repair this board or not it got a bit cooked. The back of the PCB shows no signs of failure just on that side of the ST chip. Anyone sell spares? Looking at the spot on the IC that is damaged, that group of pins all connect to either usb data+ or data-. I would be inclined to think that somehow you managed to feed the 12v down the data lines by accident. Would that be possible ? Ya very sad :( I love this thing. I must fix it. I was looking for any schematics so I could see what pins were involved but was not able to find any via google. If you have any links I would appreciate it. I can order a chip and replace if the pads are not cooked but I need the exact chip part #. I am very confused. I am not sure if USB3 would have a potential of shorting but AFAIK not so much. I've jumped through a series of hoops to find good ways to power mine through a qc3 controller that delivered the correct juice. I've never seen my irons take more than 9v. Perhaps your power delivery method needs re-evaluating? Whatever you decide ... This isn't meant to be an I know better session. Here's my tale of woe - it might give you some direction. I bought my ts80 from Banggood after about 2 weeks mine died - just a few dots on screen - no heat. Contacted BG who wanted a vid of iron being faulty. Day after they sent out a replacement which was the complete kit, arrived 10 days later. They said to keep the old dead iron + everything else .... this left me with an almost perfect second kit with just a faulty mobo. Component spares were a non-starter however I found the miniDSO has support info so I contacted them asking for price of replacement board. I got a reply next day with a return address - "send the mobo to us and we'll fix/replace and return for free". I did, they did ... and within 2 weeks I got a new mobo. I now have 2 ts80s which I power via wallwart, or batteries connected to a couple of different qc3 controllers that work well when I'm out and about. Or just the boring old USB3 wallwarts that came with the iron when I'm home. Still never seen more than 9v on the wire, whatever method I've used. But that's for you to work out. STM32F103T8U6 is the part number , the 6 at the end can be something else depending on how you buy it but it will be fine. There is a pinmap in the header files for what pin is what. Sadly I have a partial schematic that I can't release, but circuity basically matches the ts100 otherwise apart from some resistors for the USB QC negotiation. The unit is rated for a max of 12V input, and should be fine with 12V but I wouldn't push it beyond that. However more than 5V on any of the data pins will blow it instantly. @Ralim When QC4.0 comes out its planned max output power is 28W via USB-PD. QC4.0 will also support max 18W (9V Max 2A / no 12V output). 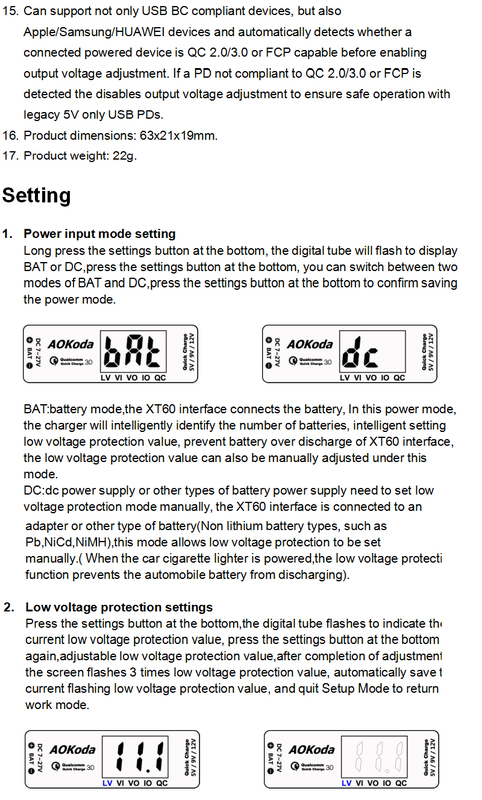 Can we somehow make USB adapter that will redirect D+ and D- to USBPD select pins on type c connector without frying anything so that in future we can get more than 18W from TS80? Is there any solution for more than 18W power output of TS80? @DjordjeMandic I got new QC 3.0 adapter recently, which is 30 watts adapter. On custom FW I see 12V supplied on TS80. It is still may be 1.5A @ 12V, but I have not seen 12V earlier, so is could be powering with 24 watts already. @salavatkhafizov Niceeee. I ordered TS80. Can't wait to try it. Maybe i will try modding it to support PD but idk if i will succeed.